One major attraction of Sabah is its nature and wildlife. 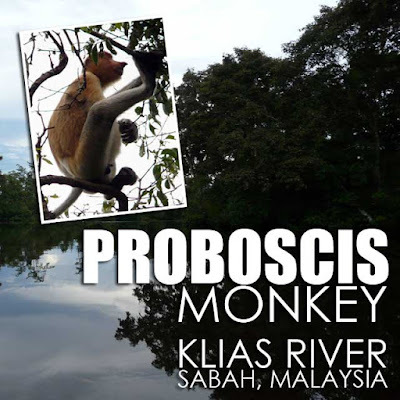 That is why I looked forward to visiting the Klias River to observe Borneo’s endangered Proboscis Monkey (Nasalis larvatus) in its natural habitat. If you decide to take the river cruise, you’ll be free for the morning. 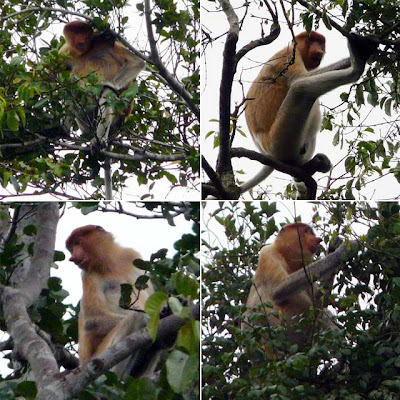 Tours are usually in the afternoon because the Proboscis Monkey comes out to feed very early in the morning or late in the afternoon just before dusk. The tour operator picked me up at my hotel at 2 p.m. From my hotel, we went around for more passengers before driving two hours southwest to Kota Klias, the jump-off point for the Klias River cruise. 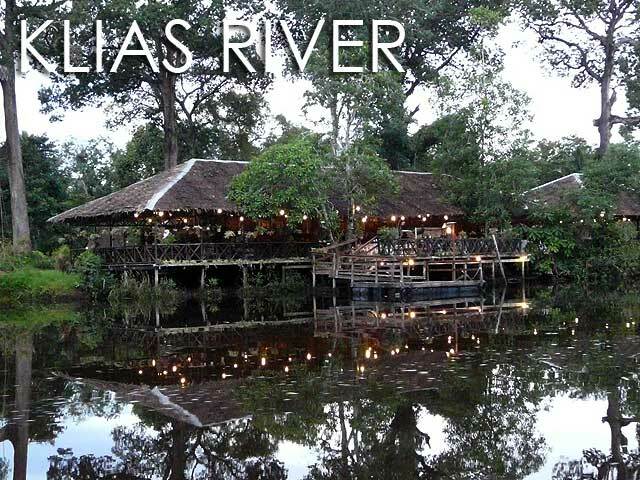 The Klias River is a large area of peat swamp which explains the brown color of the acidic water. The characteristic dark brown color of a peat swamp is a result of dissolved peat tannins in the water. At the port, we were served local snacks and coffee while we waited for ever more passengers from other tour companies to arrive. At about 5 p.m., we were invited to wear life jackets before we boarded the small boats. We left in five boats. Each boat could seat about 15 to 20 people and had a guide who would spot the monkeys and inform the driver to stop and move closer. It was challenging trying to locate the monkeys since they are quite elusive and know when there are boats around. At first, you would see only movements in the trees. 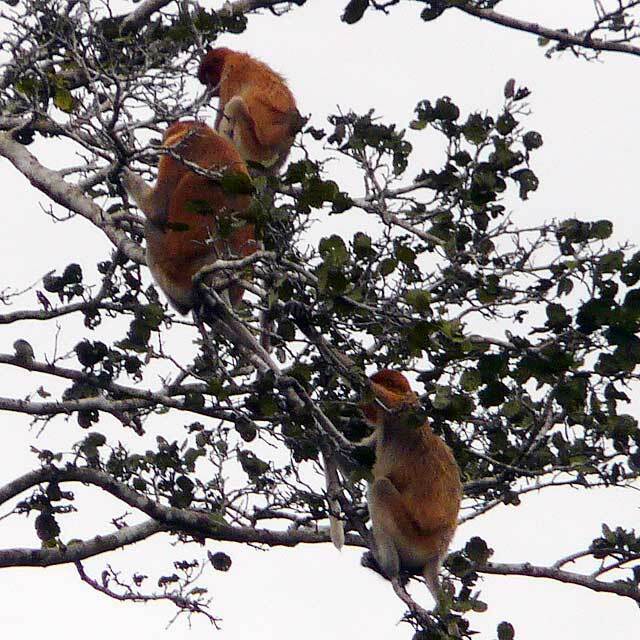 Then the guide would point and let you focus your attention on the Proboscis Monkeys silently feeding or moving about. Many times, they’d be in groups so you’d see mature male monkeys, which are the most peculiar because of their long noses and large bellies, female and younger Proboscis Monkeys. Unfortunately, you won’t be able to appreciate the features of the Proboscis Monkeys unless you have binoculars or a camera with a really good zoom. You only get to observe them from a distance especially since they are perched high up the trees and the boats can only go as far as the river banks. And taking photographs isn't that easy since the monkeys keep a safe distance from humans, the lighting is a bit dim, and the boats are quite wobbly especially when everyone stands up and tries to take photos. We went from one area to another just observing the monkeys in their natural habitat. This is much better than seeing them in zoos. While reading some literature at the port, I found out that you should never feed these monkeys fruits or any sugar since their digestive system cannot process sugar. It turns directly into gas and that would kill them since their stomachs will explode. I wonder how true this is. After dinner, we boarded the boats again for a quick river cruise to experience an early Christmas as the guides would call it. This time, we were out to appreciate the fireflies as they lit up the trees in the night sky. After showing us one tree with thousands of fireflies, we proceeded back to the port to board our vehicles back to Kota Kinabalu. If I had another day, I would have wanted to see the orangutan and other wildlife, and rafflesias in full bloom. Hopefully that happens really soon! The Klias River is about 100 kilometers southwest of Kota Kinabalu, in Beaufort District. It takes two hours to get from Kota Kinabalu to Kota Klias. You will have to book a tour or rent a car to get there. Tours cost between RM180 to RM200 per person. And that includes transfers, the river cruise, snacks and dinner. Since the Proboscis Monkeys keep their distance, don't forget to bring a pair of binoculars. And since it's a swamp area, insect repellent will prove to be handy.